I haven't seen many homes in the Warrendale neighborhood decorated for Halloween as of late. 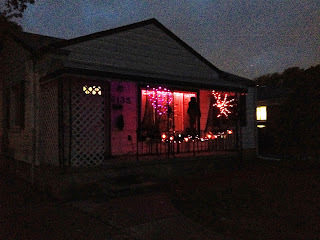 I suppose that's why I was thrilled to see this home on Greenview, just south Dayton, decorated for the season. We still have a couple of weeks until Halloween. I look forward to seeing even more homes decorated for Halloween festivities between now and the end of the month. With that in mind, I wanted to share links for some other sites with Halloween decorating ideas. My favorite ideas can be found from Better Homes & Gardens here and from HGTV here. Now, if you'll excuse me, I have to go and start decorating my house for Halloween.